Damien Chazelle follows up La La Land with that film’s male lead, Ryan Gosling, as astronaut Neil Armstrong in the story of the first man on the moon. Claire Foy plays Janet Armstrong, Neil’s wife and mother to his three children. The film opens in 1961 as Armstrong pilots a jet aircraft thousands of miles above the earth, breaking through the stratosphere and giving him, and us, a glimpse of the journey to come, before Armstrong’s aircraft suffers an equipment malfunction that sees him narrowly avoiding disaster. Disaster is a recurring theme not just for the film and NASA’s space programme throughout the 60s (and beyond), but for Armstrong and his path to the history books. Tragedy strikes his family early in his astronautical career and the effect on him can be interpreted in different ways. For me I felt he carried a death wish and this made him impervious to the true risks facing the moon landing. Chazelle has crafted an extremely analogue motion picture with a film grade that makes much of the footage feel like home movies, and even incorporates NASA footage to add an authenticity to his telling of this story. Similarly, by focusing our attention not just on Armstrong in the space race, but on he and his family’s domestic life, Chazelle strikes a balance between impossible odds and everyday life, as the astronauts families go about their lives as best they can despite the men’s mortality overshadowing normality. Several times the moon looms large watching over earth an enticing white circle of light, with the power to lure men into space. Unlike the musical joy of La La Land, First Man has many passages of almost complete silence. Chazelle succeeds in his goal to put us in the cockpit and make us feel a part of the most incredible story of human achievement yet. Foy and Gosling make for a stoic couple, with small gestures rather than obvious affection showing us how committed they are to one another, and Neil’s trajectory into the sky and the history books. 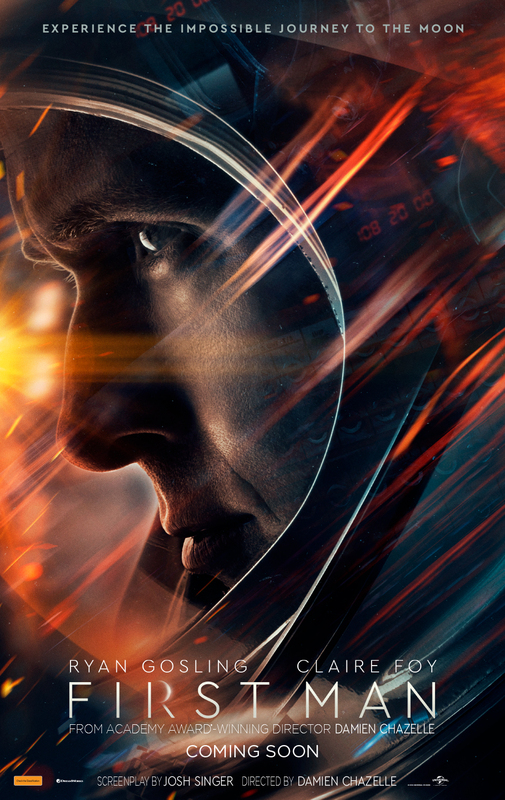 First Man is a low-key, down to earth film in many ways that also manages to deliver stunning passages of mind-boggling space flights.